Initially, woodturning dovetailed very nicely with John’s work in full time education as a senior teacher, lecturer, author and A Level examiner of Design and Technology. It is now developing as a second career after John retired from teaching. John has demonstrated to a number of woodturning clubs across the South East of England, focussing on natural edged work in the main. He has established a workshop at his home in Brighton and has set about learning about and practicing his chosen craft. Timber which has been recently felled is turned “green” to an approximate shape before being allowed to season prior to final shaping and finishing. Alternatively, the green forms are turned to a finished shape so that interesting effects develop in the final bowl as the timber dries and warps. Timber which is already dry can be worked to its final form but often contains cracks and other defects. 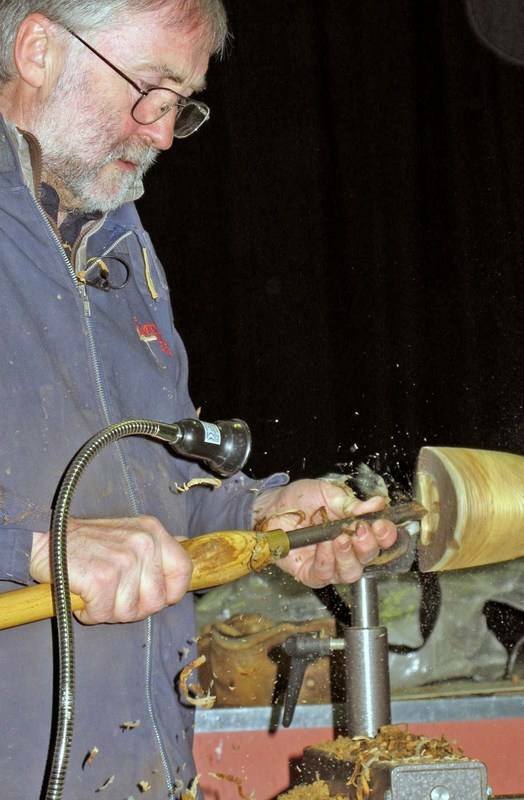 By attending wood fairs, talking to tree surgeons and wood millers, John is able to source the less usual pieces of timber which he likes to turn. Otherwise many of the people spoken to at Craft Fairs have trees which need to be removed from their gardens. Most of the material is British grown hard and softwood, often making use of timber which would otherwise be firewood. Hollowed forms provide the bulk of John’s work. Many of the more decorative pieces are left with the natural edge of the timber and will feature defects, sapwood and bark. Other pieces, which are intended as functional items, will be turned from sound material and may portray more geometric lines. John has exhibited regularly with the Society of Designer Craftsmen (formerly the Arts and Crafts Exhibition Society founded by William Morris and Walter Crane in 1887) and is an active member of the Sussex Guild. Much work has been produced to commission, often from the customer's own timber.